Hotels are legally responsible for keeping their hotel guests and invitees safe from harm during their stay. Florida state law has specific provisions for the hospitality industry. These laws can be found in Chapter 509 of the Florida Statutes. Under these statutes, as well as common law, Florida hotels are held to a high standard of care or safety when it comes to protecting their invitees. For example, if there is an accident in a Florida hotel pool where someone is hurt by another hotel guest in an altercation or a hotel guest slips and falls in their hotel room bathroom or shower, then the hotel may be legally liable for damages and subject to a negligence claim. Hotel guests and visitors should know that a hotel’s duty of safeguarding its visitors and guests goes beyond providing adequate security, fire safety, food protection and preventing slip and falls. Even measures like properly securing chemicals or monitoring chlorine levels in a pool or spa are included in their duty of care. Hotel owners and operators also have a duty to use pool chemicals in order to keep hotel guests safe from serious infections and illnesses caused by bacteria that would otherwise grow in the standing water of a hotel pool. Pool chemicals often cause injuries because of improper use and storage. People can become sick and seriously injured from pool chemicals especially when (1) incompatible products are mixed together; (2) chemicals are spilled or sprayed; and/or (3) fumes escape from a chemical container. See, “Acute Illness and Injury from Swimming Pool Disinfectants and Other Chemicals United States, 2002-2008,” published by the Centers for Disease Control and Prevention in October 2011. Pool chemical injuries can include respiratory problems; damage to the eyes; and skin injuries. Some of these injuries can be serious and even life-threatening. Over 10% of Open Hotel Pools May Need to Be Closed For Public Health Safety: Almost 1 in 8 (12.1% or 13,532 of 111,487) routine pool inspections conducted during 2008 identified serious violations that threatened public health and safety and resulted in an immediate closure. More than 10% of Public Pools Have the Wrong Levels of Chlorine: More than 1 in 10 (10.7% or 12,917 of 120,975) routine pool inspections identified pool disinfectant level violations. One example of hotel safety concerns for guests is the common practice of tossing high amounts of chlorine all at once into the swimming pool. This process is called pool shock. Why do this? Florida is an inviting environment for bacteria to grow, and keeping it at bay is a constant fight here. Often, hotels will put extra chlorine into their swimming pools to kill off the rapidly growing bacteria. Hotels should not allow swimmers to enter the pool or pool area during pool shocking. Anyone who wades into the swimming pool during the shocking process will be exposed to high levels of chlorine. They may suffer from respiratory problems, or even burns on their skin as a result. There should be warning signs and other protective measures taken during any pool shock. Failure to warn and failure to keep swimmers out of the pool area during a pool shock may be the basis of an accident claim. The most popular pool chemical is chlorine. It comes in the form of chlorine chalk tablet, liquid, or powder. They release and disperse the chemical into the pool water. The chemical kills bacteria in the pool that might be harmful to humans, like giardia and e. coli. However, chlorine is a toxin. Meaning, it is poisonous to humans. The trick is balancing using enough chlorine to kill bacteria but not so much that it can harm the humans swimming in the pool water. Swimmers who are harmed from swimming in a hotel pool may suffer something experts call a recreational water illness, or RWI. Here, the swimmer is harmed by chemicals in the water itself, either by absorbing the chemical into his or her skin or by swallowing some of the tainted water. RWI can also be caused by chemicals that have evaporated from the pool into the air. In this case, those in and around the pool may be harmed by inhaling chemical fumes. RWIs are usually considered minor injuries. The CDC reports diarrhea as the most common complaint of RWIs, but victims can suffer from gastrointestinal, skin, ear, respiratory, eye, neurologic and wound infections. However, recreational water illnesses can be serious. When a hotel guest is exposed to chlorine at the hotel swimming pool, they may suffer from severe harm (including death). Chlorine can poison you and it can cause serious damage to the respiratory tract if it is inhaled. It is a toxin that can permanently harm or even kill you if swallowed. Here’s an example of how dangerous chlorine can be: it was used in World War One as a weapon of poison gas. Chlorine has also been reported by the New York Times to have been used as a chemical weapon in Syria in 2015. How is it lethal? If there is too much chlorine in the swimming pool, the chlorine gas will collect on or near the water’s surface. Chlorine is heavier than air. Swimmers who breathe in the chlorine gas can be injured. Extremely high levels of chlorine in swimming pools can release gas off the surface, and cause chlorine poisoning. You cannot readily see the gas vapors, and by the time you realize that you smell something unusual (chlorine has an odor similar to bleach), your system may already be compromised. Chlorine is a powder, liquid, or solid that reacts with water and turns into gas. It also happens when someone swallows chlorine in a pool. As Healthline explains, chlorine will react with the water in your digestive tract just as it does with the water in the swimming pool. Chemically, when chlorine turns into a gas it forms both hydrochloric acid and hydrochlorous acid. Both are toxic to humans. This means that swimmers who are exposed to chlorine in its solid powder form at the pool and swallow it are vulnerable to serious injury. Swimmers that swallow water with excessive amounts of chlorine gas in it are also at a high risk of bodily injury form chlorine poisoning. If someone breathes in a large amount of chlorine or high concentration of chlorine gas, then he or she may die from the poison. Survivors may suffer permanent harm to their respiratory system. This includes pulmonary edema (fluid in the lungs). The Mayo Clinic advises that pulmonary edema can develop suddenly (“acute pulmonary edema”) and may cause death if there is not fast medical treatment. However, if emergency treatment is provided, then the prognosis is better. It is possible to recover from pulmonary edema caused by exposure to chlorine at a hotel swimming pool. Additionally, chlorine exposure from inhaling or swallowing chlorine can damage your circulatory system. Chlorine exposure can also permanently harm your eyes and vision. If there is too much chlorine in the pool water, the swimmer’s skin can be exposed to the chemical. The chlorine gas can also damage skin tissue. Chlorine is a chemical that can burn the skin just as an open flame can cause a burn. Also, when skin comes into contact with high levels of chlorine in the air near the pool, a chemical burn can result. Chlorine gas can also cause a chemical burn, even if the hotel guest never enters the pool water. Those who experience a burn while in a hotel swimming pool should be quick to exit the pool and the pool area. They should strip off their clothing and safeguard it for testing later, along with any towels, shoes, etc. that they had poolside. Next, it is recommended that chlorine burn victims shower with cool or cold water for an extended time. Soap can be used to remove the chlorine from the skin surface. Medical treatment should be sought. Will A Victim Have To Return To Florida To Pursue His Or Her Claim? Most personal injury claims are settled without the need to file a lawsuit and without the need for the victim to return to Florida. (95% of all personal injury claims settle). This fact applies to hotel injury claims related to chlorine exposure. However, if the claim is not settled and a lawsuit is filed, then the victim may have to come back to Florida between 1-3 times. The number of times depends on if the case goes to trial, which doesn’t happen very often (5% of personal injury cases got to trial). What Kind Of Damages Can Be Recovered In A Chlorine Injury Claim? We have spoken about the different types of injuries a victim may suffer due to overexposure to chlorine. Now, if you or a loved one have suffered injury due to a hotels negligent maintenance and regulation of the chlorine levels in the swimming pool, you may file a claim against the business. If you or the victim chooses to do so, there are a variety of damages one can receive if their injury claim prevails. These can include economic and non-economic damages. Economic damages are those that can be tallied through invoices such as hospital bills and medical equipment, or through calculations of money lost over time such as lost wages. Non-economic damages are those related to pain and suffering and loss of the enjoyment of life, that aren’t set money values and must be calculated by weighing factors such as time, level of pain, and the recovery process, to name a few. If you or a loved one suspect you have been injured by chlorine, then you can call the National Capital Poison Center at any time (day or night) for free advice. Experts there can confirm if you are suffering from exposure to chlorine and how best to get immediate medical treatment for chlorine exposure. The NCPC phone number is toll-free (1-800-222-1222) and there is no charge for contacting them. What Should You Do If You Are A Victim Of A Hotel Chlorine Injury? 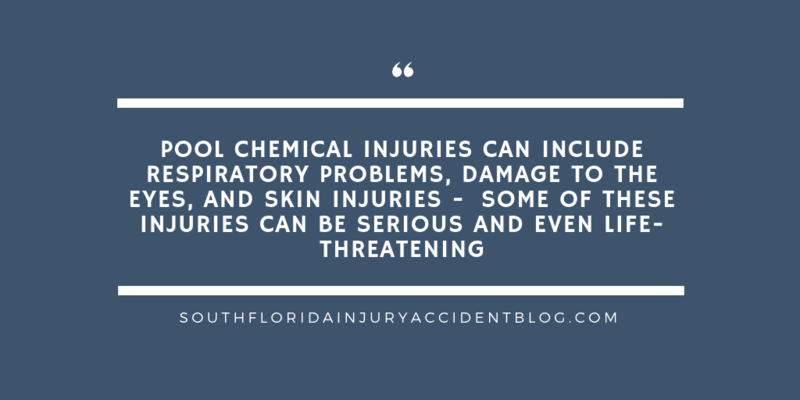 If you have been injured by chlorine at a Florida hotel swimming pool or spa, then the hotel owner and operator may be obligated to compensate you for your damages, including your pain and suffering. A good piece of advice if you you or a loved one have suffered from exposure to chlorine at a Florida hotel swimming pool, is to speak with an experienced personal injury lawyer before you file a claim to learn about some of the common disputes that can arise with these claims, including the type of evidence needed to prove a claim and the type and amount of damages you can recover. Most personal injury lawyers, like Alan Sackrin, will offer a free initial consultation (over the phone or in person) to answer your questions. We stayed for a week at the Marriot Vacation Resort in Kissimmee, Florida. As the week progress my 14 year old son became ….